I was behind this lady driver with a plate lunch resting on the trunk of her car with a plastic fork sticking up. Amazing, the plate lunch didn't fall off even after half a mile. Don't know how far she had drove before I was behind her. Anyways, at a red light, I pulled up to her in the next lane and 'informed' her that she had a plate lunch on her trunk. She replied back it was the bartender's car. But she did glance back at the rear of her car, so I presume she heard what I said to her. Just her answer had nothing to do with a forgotten plate lunch, in that context, But whatever. This happened at about 7pm in the evening if that makes an aota of difference. As I said, whatever. The mailman or mailwoman finally took the hurculean effort of stuffing MidWeek (a free local weekly advertisement newspaper) into our mailboxes. Usually the mail person just dumps a pile into a plastic bin on the lobby floor next to the mailboxes for whoever wants them enough that they're willing to reach down into the bin and grab a copy. You would use the newsprint for fish n' chips. Real fish n' chips are served on newspaper to absorb the oil (if you missed that). With malt vinegar as a condiment. Judging by the pile of Midweek's still remaining in the plastic bin at the end of the week, then only a few actually get read. Well, as long as the advertisers aren't aware of this practice all is well. That is, the advertisers pay a rate per page based on the circulation numbers. In that cents, the hundred copies delivered to our apartment building count as hundred subscribers. At least when the Midweek's were deposited into individual mailboxes this method of calculation had a ring of truth to it. 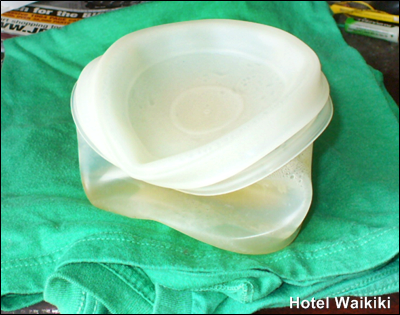 However, most tenants would just tossed the Midweek into the lobby wastebasket anyways along with the junk mail. I actually read through the latest Midweek edition browsing through the advertisements and reading the human interest columns written by local writers/celebreties. Don't remember much, but what I realized was that I hadn't read any publication in it's paper edition for over a year. Does this mean we're saving a whole lot of trees, forests even. It might mean just that providing that the new law the city council is pushing doesn't pass. They want to tack on a 20¢ surcharge for each plastic bag at the grocery store or takeout lunch counter which only means paper bags are used in place of plastic. Oh, I almost forget to mention. "Another thing," as they say. As we speak, the new phone books are stacked on the lobby floor. I'm almost certain that the phone books are suppose to be dropped off at each floor at each tenants door step. But they aren't. Haven't been in years. I thought Obama's speech wasn't long enough. If you're from the islands, we're really gonna miss Obama when he's not the president anymore. If Obama doesn't win the next election, this would be Obama's final State of the Union address. That's mainly why I felt tonight's speech wasn't long enough, in addition, to the fact, that Obama is a tremendous orator and time pass swiftly than listening to a usual lengthy State of the Union speech which has it's obligatory boring moments. Then there's the rousing standing ovation becuz the audience has been already bored to death and glad it's over until next year. Not with an Obama speech. That's irregardless where Obama deliveries a given speech. Obama made history by becoming the nation's first black president. The next election Obama will have to defy history by becoming the first president to be re-elected with the kind of negative economic numbers he has on his hands. Even Obama in an interview acknowledged the possibilty. As you already know, I don't like Mrs. Obama a lot. Not as a person, because I don't know her personally. There might be a lot other people who feel the same way and this might cost Obama votes. Me, I'm just voting for the local boy made good despite my dislike for the current First Lady. There's been enough commentary made analyzing the State of the Union speech for me to add anything to .... now what was tonight's speech about? Oh, the usual utopian themes. Any credible Republican opponent has good odds of defeating Obama. But that's just the problem the Repubs have with Gingrich leading in the primary elections. 4 years is not long enough to erase the memory of the Bush disaster and replace Democrat Obama with a Republican who is no better than the captain of the Costa Concordia cruise liner. In that sense, Gingrich is the best thing that could happen to the Democratic Party. This clown while criticizing Clinton for his affair with Monika Lewinsky was back at his office cheating on his wife with a female staffer. His own political party members forced him to resign his Speaker of the House position. I thought Romney was a formidable opponent in light of the down economy. But Romney may be history and that's a good thing for the Democrats. Oh, I will say one thing about the state of the union .... I don't think the US accomplished anything worthwhile in Afghanistan after 8 years. True, had the military not been diverted to fight the needless Iraqi War, the Afghan War would have been long over and the Taliban well the Taliban wouldn't exist. But as things stands, the reality is that after the final US troop withdrawal, the Afghans will go back to growing their poppy fields and life will continue on as it has been for centuries. If Obama doesn't get re-elected and if it was solely left up to me he should be our next governor. However, another 4 more years as president is better. This isn't gonna happen again soon. Local boy as president of the USA. You're done well, Barry. This is the second week in-a-row that I've forgotten to tune in to watch Hawaii Five-O. 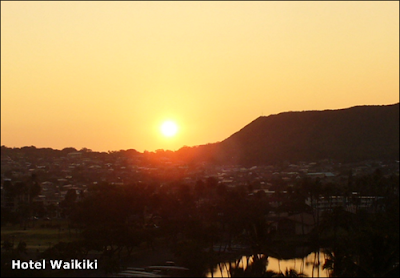 You know that tv series shot on location in the islands and airs on Monday nights. I don't watch much tv at all if that factors into the forgetfulness. Remembering to watch tv doesn't come with the territory so to speak certain shows on certain days of the week as part of a standard routine. I said previously that I ripen fresh fruit from the grocery store in the microwave. Fruits are usually shipped green to Hawaii. I forgot to loosen the lid on the tupperware container as it was cooling down. As you can see for yourself. Musta been too preoccupied on the Internet or sumpthing of that nature. Dear Reader, does your Walmart have four doors at each front entrance. And do shoppers leaving the Walmart, exit through the left door instead of the right door? And do shoppers entering the Walmart, enter through the left door instead of the right door, as well? 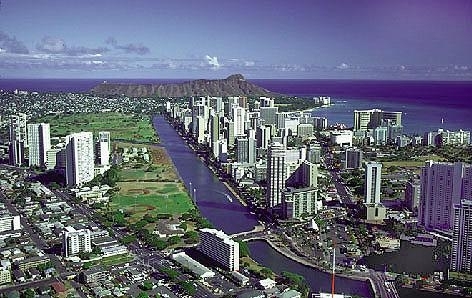 Or does this only happen at the Keeaumoku Street Walmart in Honolulu? 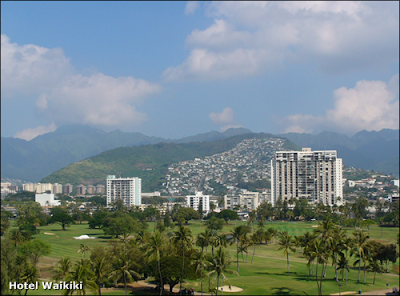 T'was an uneventful morning along the Ala Wai except for a helicopter hovering over the adjacent Ala Wai municipal golf course within a few hundred feet range from my apartment lanai (balcony). 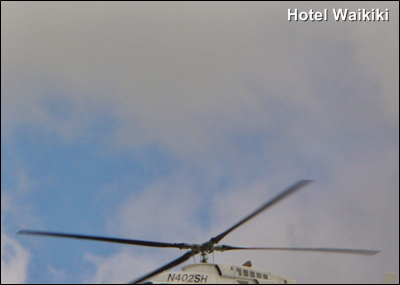 I felt like a birder taking a pic of the helicopter (photo above). It's a 4x telephoto. Then dang it at the very moment I was down loading the photos from the SD card to my computer. And why wouldn't it happen that way .... the helicopter did a flyby at eye level to my lanai bearing down the canal. Dang it. That woulda been a Kodak moment, emphasis on 'woulda'. A few minutes later the helicopter returned upstream and started hovering over the golf course again just like it did before. Perhaps they're gathering film footage for a future Hawaii Five-O episode. As you can see, there's a huge camera mounted in front of the helicopter cockpit. I don't think they're taking pics of the talapia. So I rested my camera on the lanai railing and motioned, too far for an audible, to the helicopter to do the flyby at eye level to my apartment a second time. I don't care .... just do it anyways. If you really must know .... I want to post a pic of you on my blog. Is this too much to ask er request er from one filmographer to another (over and out). So, on my cue, Mr. Helicopter Pilot, camera, lights, action. Like I said, I was feeling like a birder. Well, it did happen again. 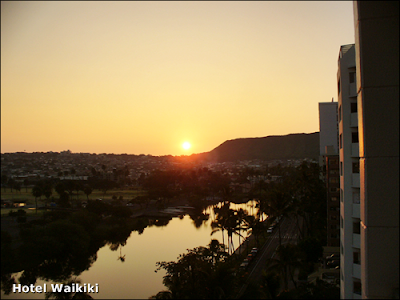 The helicopter started to descend and then fly low above the Ala Wai canal with a trajectory that would take it's flight path pass my lanai again. However, my trusty 4 megpixel camera which I always keep handy has a 1½-inch LCD viewfinder. 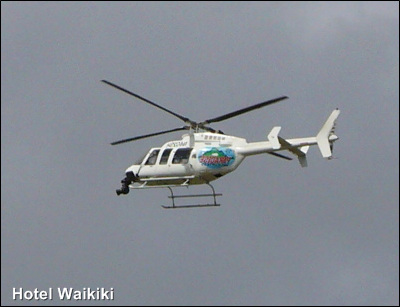 When the helicopter flew by within arm length pass my lanai I wasn't able to find the darn bird in my tiny viewfinder. Remember it was a moving helicopter to boot. I was this close to heaving ho the camera into the Ala Wai canal many feet below. The fleeting kodak moment, below.